Two Hizbul Mujahideen terrorists were on Sunday killed when they tried to ambush a police party that included three officers of the rank of superintendent of police in south Kashmir’s Pulwama district. One of the slain terrorists has been identified as Shahbaz Safi Wani alias Rayees Kachru, who was active in the area since June, 2016. Wani was involved in an attack on a security picket outside a minority camp at Tumlahall in Pulwama district, besides snatching two self-loading rifles along with magazines, officials said. The other one is a ‘recycled’ terrorist, Farooq Ahmed Hurrah from Shopian, who had surrendered in 2010 and was out on parole. The police have seized two weapons, including one looted SLR, Deputy Inspector General of Police (South Kashmir) S Pani said. 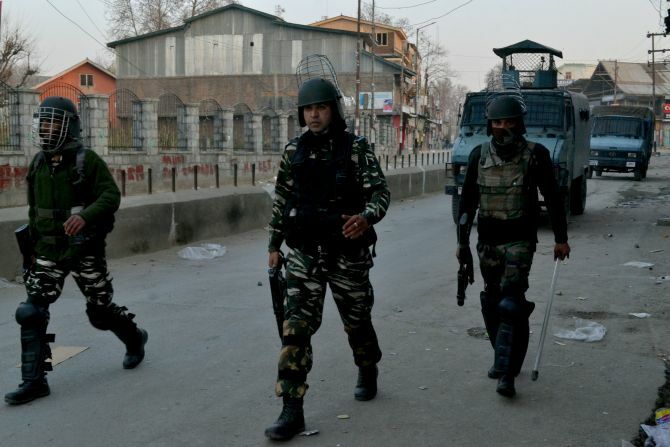 The incident happened at Padgampora, on the Awantipora-Pulwama border, around 35 km from Srinagar, when a cavalcade of senior superintendents of police of Pulwama and Awantipora Raees Ahmed and Zahid Malik was going along with the district’s Additional Superintendent of Police Chandan Kohli. IMAGE: The terrorists, who were travelling in a car, came from behind and started firing at the police vehicle. The terrorists came in a car from behind and started firing at the last vehicle of the convoy carrying Kohli, 32, officials said. The police personnel quickly took cover and retaliated to the fire in which two terrorists were killed, they said. The driver of the car, in which the two terrorists were travelling, managed to flee, the officials said, adding that a hunt has been launched to nab him to ascertain whether he was kidnapped or a part of the over-ground network of the terrorist group. The police have also seized a hand grenade and some ammunition, Pani said. Pani, a seasoned police officer who has done credible work in controlling militancy in Shopian and Kulgam districts, lauded the role of the police personnel who swiftly neutralised the two terrorists. On March 9, two Lashkar-e-Tayyaba terrorists were killed in an encounter at Padgampora. A civilian was also killed in the incident. 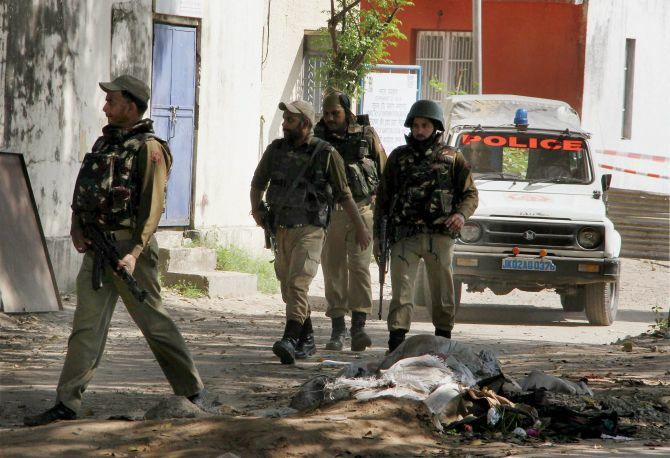 The Padgampora area has witnessed several encounters in the past and is believed to be infested with terrorists associated with banned outfits such as the Hizbul Mujahideen and Lashkar-e-Tayyaba. Terrorists carried out two attacks on police forces in Jammu and Kashmir on Saturday night, pushing the state to a high alert, days ahead of Prime Minister Narendra Modi’s visit and the upcoming parliamentary by-elections there. 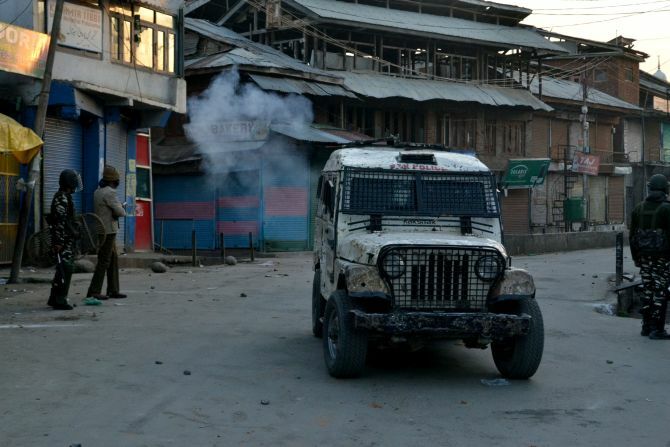 The first incident was reported from Budgam district, which falls under Srinagar Parliamentary seat going to polls in the second week of April, where terrorists barged into the house of a sub-inspector last night and took his son and a nephew hostage, ransacked the house and set a car ablaze. The terrorists drove away in the car with the two boys but let them off later, setting the vehicle on fire, police said. The incident came barely three weeks after terrorists had barged into the house of a senior police officer in Shopian in South Kashmir and ransacked his house, sending a shockwave among police officers fighting militancy for last 26 years. The terrorists entered the house of Sub Inspector M Subhan Bhat and started ransacking his house in Chadoora area of the district in central Kashmir, official sources said, adding that they later took his son and a nephew as hostage and drove away in the car. According to the police, the militants said they wanted to kill the officer who is currently posted at the Baramulla district jail, where militant-turned separatist leader Masarat Alam is lodged. Director General of Police S P Vaid said that stern action would be taken against those responsible for the incident. “It’s the most unfortunate incident to have happened. The terrorists are feeling the heat and stooping so low. Our humane approach should not be seen as our weakness. I will ensure welfare of every personnel in my force and such incidents will be dealt with an iron hand,” he said. Director General of Prisons S K Mishra said that he has called for a review meeting on Monday to ascertain the safety of his personnel and their families guarding various jails in the state. In another incident, three boys, riding a motor-cycle, threw chilly powder into the eyes of a personal security officer of a cleric in Jammu, besides hitting him with blunt objects and fleeing with his AK-47 rifle. A high alert was immediately sounded in Jammu city and security was beefed up in view of the prime minister’s visit there on April 2 for the inauguration of the Chenani-Nashri tunnel. The incident took place last night when constable Mohammed Hanief, PSO of Anjuman Minhaj-e-Rasool chairman Maulana Dehlavi, was walking down to the district police lines on Saturday night, police said. Police have arrested two of the suspects -- Masood and Shahid, and launched a manhunt to track down the third accused Asif who decamped with the AK-47 rifle. Masood hails from Shopian district. All the three have a police record of being stone-pelters and have been missing for some time. The injured constable has been admitted to the Government Medical College in Jammu.